Blinds Chalet announces their ‘Buy 3 Get 1 Free’ sale on Classic 2” Faux Wood Blinds. Many consumers are financially tapped out after the holidays, which is why Blinds Chalet has chosen to discount faux wood blinds instead of natural wood blinds. “Faux wood blinds are an economical alternative to real wood blinds,” says Chris Stanley of Blinds Chalet. “Today’s faux wood is almost indistinguishable from real wood and offers the same natural look as real wood without the environmental destruction of clear cutting.” For those who want to upgrade their home or are currently remodeling a home, office or apartment, these window treatments finish a room with very little added expense. Kitchen window blinds have to be made of certain materials in order to last. You want materials that won’t warp or distort when exposed to moisture. You want something that won’t retain odors or show stains, something that’s easy to clean and something that will last. The Premier 2-Inch Faux Wood Blinds are among the highest rated blinds on the market for certain distributors. There are a couple of reasons why. The first is they look good, they are affordable and they come with a free routless upgrade. They sell at a higher rate than most other window treatments because of their versatility and ability to look good in different environments. Blinds Chaletannounces five-star rated ‘Premier 2 Inch Faux Wood Blinds,’ now come with free routless upgrade. The Premier 2 Inch Faux Wood Blinds are among Blinds Chalet’s most popular window treatments in terms of affordability, quality and practicality. They are also the best selling 2-inch faux wood blinds that Blinds Chalet offers. Many people are in need of window shades and blinds within days. These might include interior decorators or designers, or it may include people about to show their house who want a higher resale value. It might also include someone who is about to throw a party when their young child decides to draw Spiderman in permanent marker on the blind. Whatever the reason, there are companies that custom make blinds and shades in only a few days and can have them at your door within a week. With the recession, people are looking for discounts in all aspects of their lives. From window treatments, to vacations, to clothing purchases, finding savings has become a priority for many shoppers today. Blinds Chalet understands customer's concerns about finding quality products for less, which is why Blinds Chalet is currently offering 30% off any order. People are losing their jobs and homes every day across the US. When the 2007 Census was taken by the US Census Bureau, 37 million people were recorded as existing in poverty. From the turn of the century until 2007, 6 million more Americans were added to the list of those living below acceptable levels. Even though the United States is considered one of the wealthiest nations on earth, there are so many people here that are struggling to simply stay alive. 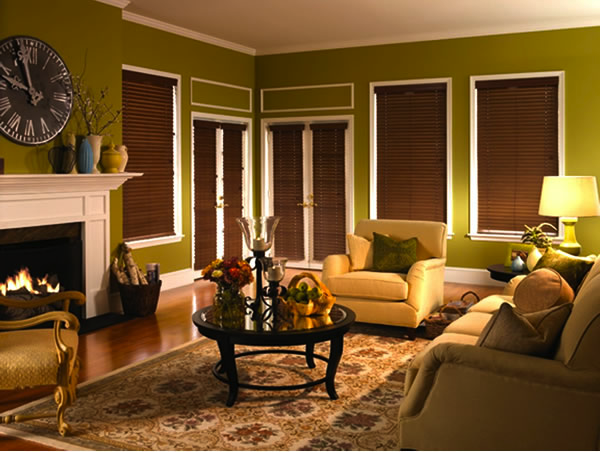 Consumers are often unaware of the difference between faux wood blinds and real wood blinds. Not only do many not know the difference between the two, but they are also unaware of the benefits of faux wood blinds. There positives and negatives to any product. And the same goes faux and wood blinds. Once shoppers make themselves aware of the differences and the advantages to each it is normally obvious which is the better choice for their specific situation. One popular upgrade on wood and faux wood blinds in routless blinds or no holes privacy upgrade. What is a routless blind and what are the advantages and disadvantages of upgrading to a routeless blind? Spring is just around the corner. We have already started our spring-cleaning and this year, it is going to include the blinds and shades. Normally, spring cleaning just means we take them down and wash them real good. However, this year it is time to replace. If you picture cheap, fake and tacky blinds when you think of faux wood window blinds, then you are in for a big surprise. Over the last few decades, faux wood has come a long way. Most people can't even tell the difference between real wood and faux wood until the go up and touch it. Nothing brightens up a home like new window treatments. The only problem is there are too many window treatment options to choose from. There are just tons of blinds out there. How can anyone ever decide between real wood and faux, between white and off white? Then you throw environmental blinds in the mix and you have a completely new slew of choices.